Warren Prosperi is self-educated in the tradition of Optical Naturalism, which was developed by Caravaggio, perfected by the 17th century masters Hals and Velasquez, and continued by Zorn, Sargent and Sorolla. This tradition examines the nature of visual experience and the structure of an actual moment. It is the basis of how Warren and his wife, Lucia R Prosperi, approach portraiture: presenting a moment, which reflects the character and environment of the subject. Their work has most recently shown at the National Portrait Gallery in Washington D.C., a solo show at the Air Gallery in London, and prior to that at the Lyman Allyn Art Museum in New London, Connecticut. They have also shown at Capricorn Gallery in D. C.; Far Gallery in New York; Doll & Richards Gallery in Boston and Cambridge (where both Lucia and he were directors); Islip Museum on Long Island; Francesca Anderson Gallery in Boston; Boston Symphony Hall; and had a solo show at the Michael Allen Gallery in Boston. Warren taught at Harvard’s Continuing Education Program and from his own studio for ten years. "Museum Epiphany III" at the MFA Boston. Their commissions are both private (focusing on both individual and group family portraits) and public (which also include individual portraits and historic murals). To highlight a few of their more recent public commissions, “Ether Day, 1846” which is a large mural-size painting of the first public demonstration of Ether, hangs in the Ether Dome at Mass General Hospital; Drs Jerry Austen & Sam Thier, former leaders of Partners in Boston (to mention only two of the eighteen portraits painted of distinguished doctors commissioned for MGH, presently hanging throughout the hospital); Two murals for Rhode Island Hospital hanging in the Lobby, depicting care in 1868 and 2000; Six historic murals on permanent display at the Joslin Diabetic Clinic; Dr. Donlin Long, former Chief Neurosurgeon Johns Hopkins; Retired Massachusetts Senate President William Bulger; Vartan Gregorian, President Carnegie Institute; and Adele Simmons, former President, MacArthur Foundation, to mention a sampling of a few of the more public commissions. 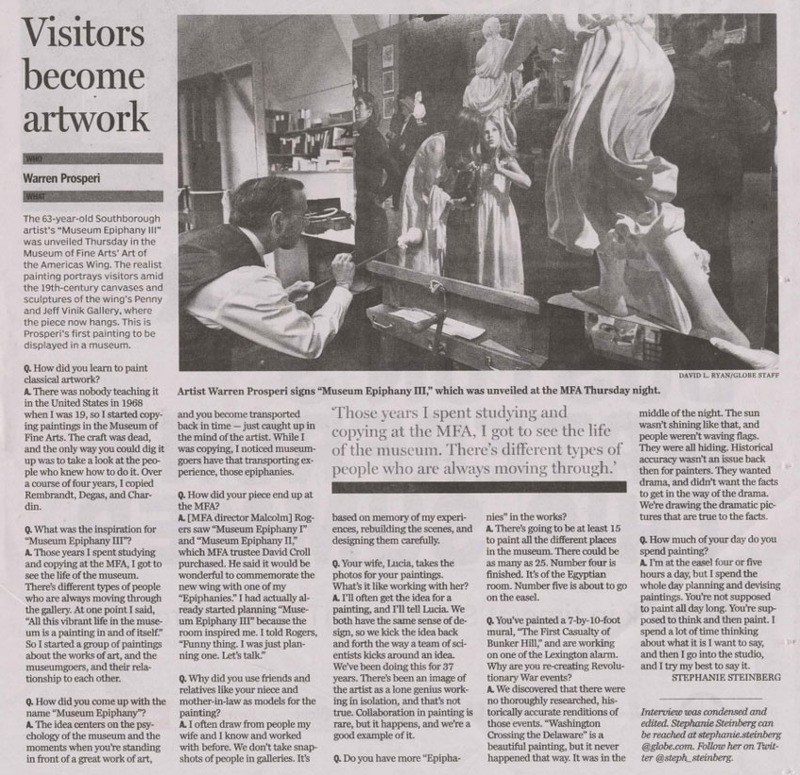 In the spring of 2012, Warren was commissioned by the Museum of Fine Arts, Boston to create a painting portraying visitors amid the 19th-century canvases and sculptures of the wing's Penny and Jeff Vinik Gallery, where the piece now hangs. This is Prosperi's first painting to be displayed in a museum. Warren and Lucia have also started a project called "A Suite for Unsung Heroes," a series of murals which depict "aha moments" of the Revolutionary War. The first of these murals, "The First Casualty of Bunker Hill" was unveiled at Vose Galleries, and was areviewed in the Boston Globe. To read the entire review, please click here. Warren is also a landscape painter whose work is hanging throughout the United States and Europe, which is also in the tradition of Optical Naturalism, as developed by the American Impressionists.